Teachers in Oakland, California, went on strike Thursday in the country's latest walkout by educators over classroom conditions and pay. Melissa Colorado and Anoushah Rasta report. Thousands of striking teachers in Oakland, California, will bring a demonstration for higher wages into a second day, union officials said. The strike launched Thursday and is the country's latest walkout by educators over classroom conditions and pay. Teachers and supporters plan to be at the picket lines early Friday to continue the strike, according to the union. The city's 3,000 teachers are demanding a 12 percent retroactive raise covering 2017 to 2020 to compensate for what they say are among the lowest salaries for public school teachers in the exorbitantly expensive San Francisco Bay Area. They also want the district to hire more counselors to support students and more full-time nurses. Teachers picketed schools as the strike began, and their union leader said the educators were forced to do so because he said administrators did not listen to teacher demands for two years. "For two years we have been negotiating with the Oakland Unified School District to make our students a priority over outside consultants and central office administrators," said Oakland Education Association President Keith Brown. "It's time for them to listen to the voices of the community." The walkout affects 36,000 students at 86 schools. "I want smaller class sizes so I can give my students what they need. It's really hard to be the teacher, the nurse, the social worker or the counselor to 25 students in a day," Estefana Ramos, a 1st grade teacher at Manzanita Community School, told NBC Bay Area. The Oakland Unified School District said schools will remain open, staffed by non-union employees and substitute teachers. However, parents should not expect school as usual, it said. 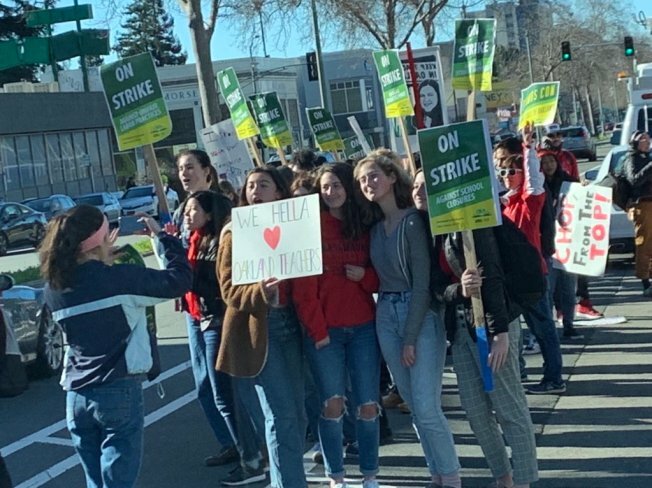 Oakland Unified School District spokesman John Sasaki said negotiations with striking teachers will resume Friday and that school administrators hope to get a counter proposal from the union. Oakland teachers have been working without a contract since 2017 and have said their salaries have not kept up with the cost of living in the expensive San Francisco Bay Area. Speaking to a crowd of teachers and parents Thursday morning outside Manzanita Community School, where Rep. Eric Swawell, D-Calif. District 15, was also in attendance, Brown demanded reinvestment in Oakland schools, student support, more nurses, counselors and librarians, as well as smaller class sizes and a living wage to keep teachers in Oakland. "These are the kinds of things that all teachers in California stand for and the 325,000 teachers of the California Teachers Association stand fully behind Oakland Educator Association teachers and Oakland," said California Teachers Association President Eric Heins. Rep. Barbara Lee, a democrat who oversees East Bay cities, said Thursday that she stands behind teachers. "They deserve a living wage and the tools they need to give our kids the very best education. I’m hopeful OUSD and the teachers’ union can come to a quick agreement that prioritizes our students and the teachers who educate them," Lee tweeted. Teachers and supporters marched from schools to gather at Frank H. Ogawa Plaza in downtown Oakland. Aerial footage shows a sea of people in red, the color used in #Red4Ed teachers movement, on the streets of Oakland. Picketers chanted "We are Oakland!" and some held signs saying "Kids Deserve Better." Forty-nine-year-old Laravian Battle, a math teacher at Soujourner Truth alternative high school was among Thursday's protesters. She was named Oakland Unified's Teacher of the Year in 2016-17. "If teachers are worried about how to pay their bills how can they focus on a lesson plan?" said Viviana Rodriguez, whose fifth-grade son joined her at the protest. A teacher's starting salary in the district is $46,500 a year and the average salary is $63,000, according to the union. By comparison, a starting teacher makes $51,000 a year in neighboring Berkeley and the average salary is $75,000, the union said. Initially, the district offered a 5 percent raise covering 2017 to 2020, saying it is squeezed by rising costs and a budget crisis. In negotiations Wednesday aimed at averting a strike, the district increased its proposal to a 7 percent raise over four years and a one-time 1.5 percent bonus. The offer went higher than the recommendation of an independent fact-finding report that suggested the two sides agree to a compromise 6 percent retroactive raise. Sasaki said the district is already making cuts worth $22 million and that its financial situation makes it difficult "to make any more movement." He said Thursday that it's up to the teachers to respond. But union officials with the Oakland Education Association already rejected the counteroffer Wednesday, and on Friday, Brown said that the ball is actually in the district's court. Brown said the union wants an agreement that will change how funding operates at the district and that the latest offer does not address the high cost of living that is driving educators out of Oakland. Oakland Mayor Libby Schaaf tweeted support for teachers Thursday, saying "As an OUSD alum and parent, I stand w/ Oakland teachers who deserve higher wages and better working conditions. To ensure a sustainable education system where everyone thrives, we need a fiscally stable OUSD that is locally controlled. Our goals are shared." Nearly 600 teachers left their positions at Oakland public schools last year, according to the union, which says the district can't retain teachers or attract experienced new teachers with such low wages. The talks have not centered on pension or health care benefits, which are free for full-time workers and their beneficiaries. The Oakland district spends an additional $13,487 per teacher annually for health benefits for educators and their families. The union has also called for the district to scrap a plan to close as many as 24 schools that serve primarily African-American and Latino students. The union fears the move would likely lead to further losses of students to charter schools that drain more than $57 million a year from Oakland public schools. Principals are not in the same union as the teachers and plan to be in schools Thursday but have come out in support of teachers' demands. About 30 of Oakland's more than 80 school principals went to the state Capitol on Wednesday to call for better school funding ahead of the strike. "Pretty much every principal is in support of the teachers having higher pay," said Cliff Hong, an Oakland middle school principal. Recent strikes across the nation have built on a wave of teacher activism that began last spring. Unions for West Virginia teachers, who went on a nine-day walkout last year, ended their two-day strike Wednesday night. Last week, teachers in Denver ended a three-day walkout after reaching a tentative deal raising their wages. Teachers in Los Angeles, the nation's second-largest school district, staged a six-day strike last month that ended when they settled on a 6 percent raise with promises of smaller class sizes and the addition of nurses and counselors. NBC Bay Area's Bob Redell, Pete Suratos, Kiki Intarasuwan and Brendan Weber contributed to this report.